Just now, my fingers hovered over the keyboard, not quite ready to land. If I don’t write about it, if I pretend that tomorrow is just another day, maybe it won’t be real: one year since my Dad’s last birthday. I have a parade of Dad’s birthdays marching through my head. 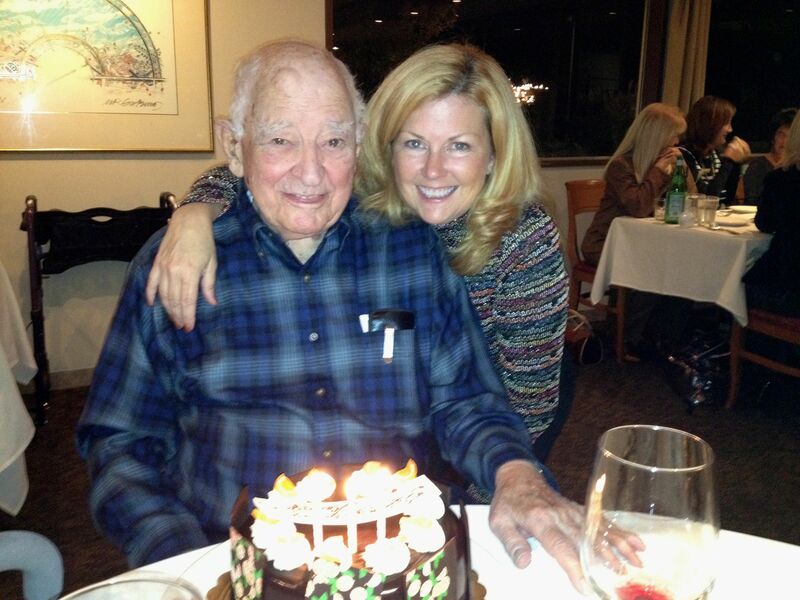 There was his 87th birthday when he had a speech all prepared beginning with, “Four score and seven years ago….” That was the last time I tried to faithfully match the number of candles to his age. Five years earlier, Dad’s surgeon had emerged after an eight hour cardiac bypass operation with the good news that the procedure was a success, and the bad news that he expected this one, Dad’s third, would last only five years. When we gathered the family for his 87th, the five year timer had gone off. We faced the possibility, even the likelihood, that Dad would die within the year. We drank a lot that night, liquid accompaniment to the many toasts, stories and recitations of Dad’s favorite poems. In the midst of it, Dad cocked his head, raised his glass and looked directly into my eyes. I think of the smile in this picture as my smile. He would purse his lips gently, the way I do when I’m about to cry, and the corners of his lips would lift. He held that pose, for one beat, two, three. That gaze remained on his face for as long as I wanted to look back. To me, it said it all. Two years later, Dad moved permanently to California. The word went round before every birthday: you should come, it might be his last. When someone’s death is predicted for nine years running, it starts to become comedic. We began spreading out family visits to provide Dad with something to look forward to. 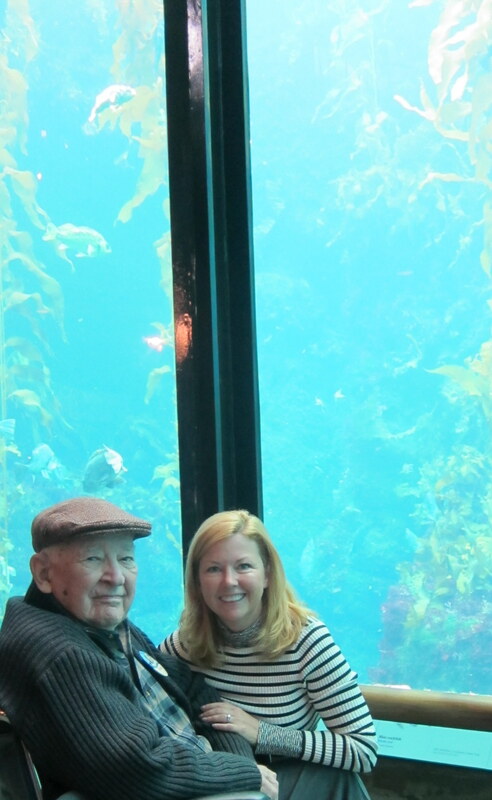 Two years in a row, I turned Dad’s birthday into a road trip, taking him to Monterey to enjoy an ocean front room and a visit to the Monterey Bay Aquarium. As Dad gazed up at the aquarium’s 28 foot high tank, the pale blue light of the tank washed over him. He seemed to drink in the majesty of the display before him: swaying fronds of kelp, swirling sardines, cruising fish. Its beauty moved him. 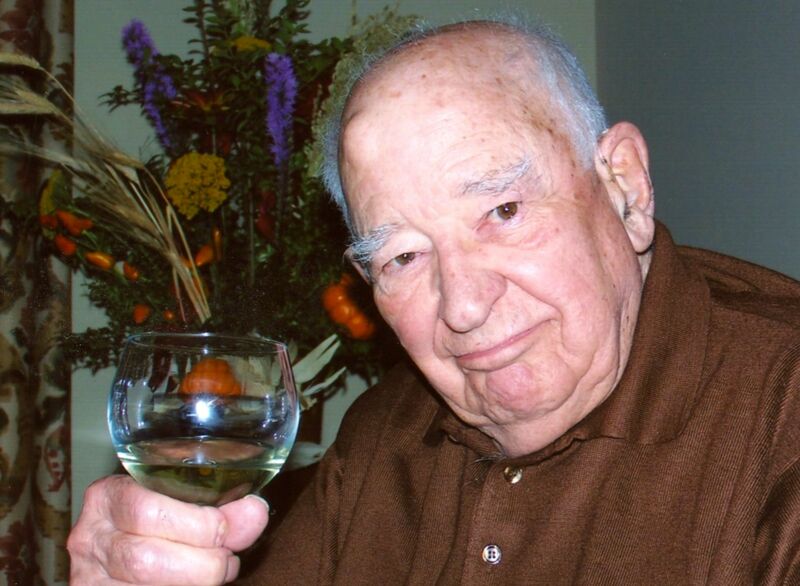 By his birthday last year, his 96th, much of that joy had slipped away. His rich, brown eyes had faded, and it was harder to rise to the occasion of a party in his honor, even a small one. He was quiet, though he enjoyed his lamb, and of course there was chocolate cake. He always had room for chocolate cake. I could not envision celebrating his next birthday with him. And I was right. This year, there’s no Pendleton shirt wrapped and ready, no bacon-and-eggs breakfast planned, no chocolate cake in the refrigerator. For most of the world, it will be just another day. But for me, it’s the first birthday that wasn’t.